Eileen here. Below is a glossary of some general aquarium hobby terms. Once complete, we’ll try and publish the Aquarist’s Glossary of Term’s somewhere online, but in the meantime, hopefully it helps in pieces. Check out part 1 and part 2 here. Compatibility: This refers to how well tankmates are likely to get along. For example, Neon Tetras are compatible with Zebra Danios – they would be fine together in a tank. A ten inch Peacock Grouper however, would NOT be compatible with a one inch Skunk Cleaner Shrimp – the shrimp would likely end up a meal pretty fast. Coral “Frag”: A “frag” is a small piece or colony of coral, often mounted on a small artificial plug. Frags have become very popular in recent years as an inexpensive and environmental way of trading and acquiring smaller pieces of the large and sometimes rare or expensive coral colonies available in the hobby. Filtration: There are three main types of filtration used in the aquarium trade – chemical, mechanical and biological. Chemical filtration uses materials like carbon or resins to remove or neutralize chemical compounds on the water. Mechanical filtration physically removes debris and waste using mesh, sponges or other materials. Biological filtration uses bacteria, plants or other living materials to remove waste from the water. A complete filtration system will use all three of these methods in a system. Different types of filters that use some or all three of these methods include power/hang-on filters, wet/dry filters, undergravel filters, canister filters, fluidized beds and others. Hardiness/ Difficulty: Both of these terms are used to describe how easy something is to care for. Their meanings tend to be relative opposites of each other and most places only use one, but they are in fact seperate terms. An item that is “hardy” is generally easy to care for (or hard to kill, dependong on how you look at it). A “difficult” item often has specific needs, a tricky diet or is very delicate. Beginning aquarists should look for a hardy fish with low difficulty. Keep in mind however that hardiness does not always equal easy; research your choices carefully! Kelvin Rating: The “degrees Kelvin” are a way of measuring the temperature of the light, not to be confused with normal temperature of heat as measures in Celcius and Fahrenheit. While the technical terms and measurements of the Kelvin scale can be found in detail marine aquarium publications and on the Internet, the important thing for the average aquarist to know is the higher the number, the more blue the light. (On the good old “ROY G. BIV” rainbow scale, low Kelvin temperatures are on the R side while high temperatures are at the V). Most saltwater and reef aquariums use higher Kelvin lighting than freshwater aquariums. Lighting: The most common types of lighting for aquariums, in order of intensity, are fluorescent, compact fluorescent (also known as power compact), and metal halides with different classifications within each of those types. Actinic is also a type of bulb used and refers to blue lighting with a wavelength of around 420-460nm and is used in saltwater and reef tanks. Always research what lighting would be appropriate for your tank as well as what livestock is appropriate for use with your lighting. Live Rock: Live rock is used in saltwater aquariums as a natural decoration and foundation as well as for the benefits of the organisms growing in an on the rock. It is essentially rock that has been in the oceans for months or even years so that bacteria, algaes, plants, crustaceans, corals and other organisms populate and live on the rock. “Cultured live rock” refers to rock that is either manmade from concrete-like mixtures or is terrestrial rock and is placed in the ocean for a period of time to turn “live”. Live rock is also refered to as “cured” or “uncured”. “Uncured” rock is newly harvested rock that may not be fully cleaned of organisms that do not survive harvesting. “Cured” rock is usually much cleaner and stable and is safer for more established aquariums. Different types of rock are available from different regions, but the main difference between these varieties is simply the region it is harvested from and the shape or density of the rock. Tonga, Fiji, the Solomon Islands and the Caribbean are popular origin regions for live rock. 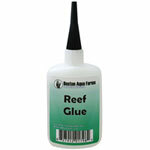 “Reef Safe”/ “Invert Safe”: These two terms can refer to plants and animals or to products like medications. “Reef Safe” items are safe for tanks with polyps and corals while “Invert Safe” is a broader term that includes other animals like crabs, shrimp, anemones, snails and others. While some references use these terms interchangeably, they do not always mean the same thing. For example, hawkfish are generally considered “reef safe” in that they don’t actively eat or damage corals, but they are not “invert safe” since they prey on crustaceans. Starter fish: While these fish are usually very good for beginner aquariusts, the term “starter fish” usually refers to those fish which are considered hardy enough to use to start and cycle an aquarium. The spikes in ammonia, nitrite and nitrate during this cycling process can be dangerous to any livestock, but those typically used as starter fish are more likely to survive this process than others. Tank-raised/ Captive-bred/ Aquacultured: These three terms generally mean the same thing, although “aquacultured” is used more for corals, plants and invertebrates and “tank-raised” and “captive-bred” usually refer more to fish. “Aquaculture” by definition is the growing of freshwater and saltwater organisms under controlled conditions, much like agriculture is the growing of crops on the land. This can range from farms used to grow fish like catfish and tilapia for food production to breeding ornamental fish for the aquarium industry. Tank-raised and captive-bred fish are typically bred on a smaller scale than farms created for the food industry. Some tank-raised fish that are commonly available are fish like clownfish, dottybacks, gobies and some cardinalfish as well as a few freshwater fish like angelfish and discus. Tank-raised fish are often more resistant to aquarium-related diseases than wild-caught fish but can be vulnerable to diseases introduced by their wild-caught counterparts. Strict regulations and pressure on wild fish populations are making captive breeding of fish more common and tank-raised fish more sought-after in the aquarium trade. Territorial/ Aggressive: Some aquarists use these terms interchangeably but they have quite different meanings. “Territorial” fish or invertebrates establish and often actively (and potentially aggressively) defend a particular territory but do not necessarily harm other organisms that do not invade this territory. “Aggressive” fish may show some of the same behavior but do not do so to defend a certain area, but will instead attack and potentially harm any other organisms they may find threatening in a tank. A territorial fish (damsels, cichlids, dottybacks, etc.) can often be safely kept with other tankmates as long as they have enough territory to defend and other fish do not share this area, while tankmates for an aggressive animal (triggers, some cichlids, predators, mantis shrimp) must be chosen very carefully, if kept with any other tankmates at all. 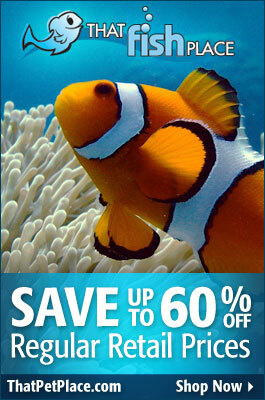 Tropical: Almost all plants and animals kept in the aquarium trade are tropical, both freshwater and saltwater. This term refers to their temperature, not their water conditions or where they come from. The tropics are geographically the are between the Tropic of Cancer (23.4º N latitude) and the Tropic of Capricorn (23.4º S latitude). In terms of climate, this usually refers to water temperatures of around 74-82º F, depending on the region. 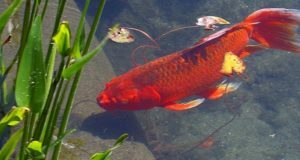 Some notable exceptions are goldfish, koi and a few saltwater fish from temperate regions (the area between the Tropics of Cancer and Capricorn and the Arctic and Antarctic Circles, including the moderate subtropic region). The aquarium fish from these regions have average water temperatures of around 65-72ºF. Water change: A water change as refered to within in the aquarium hobby is when an aquarist removes a portion of their tank water (usually 10-20%, once or twice a month) and replaces it with fresh, clean water. This is done to remove fish waste and to keep water levels appropriate, especially levels like nitrate and phosphate or even to promote breeding in some fish. A water change is not when an aquarist merely tops off a tank to replace water lost through evaporation – only pure water evaporates and salts, waste and other compounds are not removed when the water they are dissolved in evaporates.